Bingo Hall is one of the few US friendly online bingo brands on the market today. They’ve added additional software since the initial launch and the design has also come a long way with a fully responsive mobile website. The major gripe with this site and its sisters, Bingo for Money, Instant, Vic’s, South Beach and Bingo Canada, is the customer service. Reps are either uninformed or rude but few issues have been reported regarding issues with payouts. If you’re not an American player then chances are you wouldn’t spend a lot of time here because of all the other options open to you not to mention they only offer 75-ball bingo games. 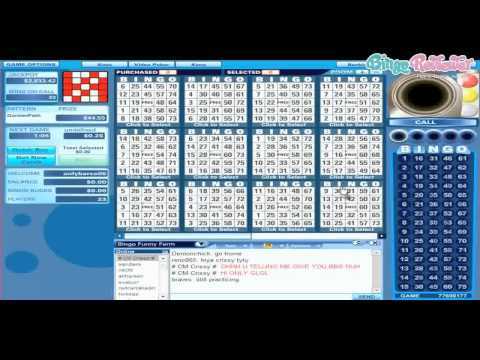 In terms of bingo there are only 75-ball games available in rooms such as Fair and Square, Desperate Housewives, Crazy, Dollar, Quarter and Nickel. Cards are on sale for as low as 5 cents and pre-buy is offered for most games. The Taboo Room is open daily from 11pm to 2am EST and is the place where anything goes including big cash prizes. Slots: 7 Monkeys, Greedy Goblins, Crazy Jungle, Alkemor’s Tower, Good Girl Bad Girl, Event Horizon, New Tales of Egypt, Gypsy Rose, Lady of the Moon, Trolling for Treasure, Get Cracking, Three Times the Riches, Hollywood Reels, 2 Million BC, Karat Crazy, Fire and Ice, Quest for the Minotaur, Lost Gems of Brussels, Wild Cherry, Summer Party, Fruit Slot, Beauty Salon and many more. Video Poker: Jacks or Better, Joker Poker, Double Bonus, Deuces Wild, Bonus Poker, All American, Deuces and Jokers, Double Joker. Pull Tabs: Gold Rush, Alleycat, Bank Heist, Hole in One, Alien Encounter, Monster Bucks, Money Hog, Jungle Safari, Pirate’s Cove, The Ol’ West. There are many promotions available beyond the initial Welcome Bonus. Play early morning or late night games for a chance to win special jackpots or raffles. The social factor is apparent with the variety of chat games and promotions. Slot tournaments are another feature offering players the chance to win cash prizes. Bingo Hall has developed a reputation for being US friendly and the majority of its players come from The United States. With that said, there are a few downsides to make you aware of. In order to cashout you are required to visit live help. The customer service tends to be poor across the brands in this group so it can be quite frustrating to deal with them especially when you have no choice and need to request a withdrawal We give Bingo Hall 2.5 Pink Hearts based on the importance of customer service but it’s game selection and variety of promotions help to pick up the slack. With the $25 you receive from Bingo Hall when you register your account, it will be no time at all before you understand their logo "Home Sweet Hall". Besides the generous sign up bonus, you'll receive a gift of Welcome Bonuses on your first deposits. Continue to be a loyal player and reap the rewards as you move up to higher and higher levels. Running on the popular Parlay software, Bingo Hall gives their players a wide variety of games. So whether you are an avid bingo fan, slot player, poker player, or casino player, you'll find all you need to play and win at this site. They have over 2500 online players playing, and when you see how high ($37,000 plus on one!) the PJP's are right now you'll want to be in this mix and be the lucky winner of one of these massive prizes. You can find their current promotions on the promotions tab on their webpage or you can also subscribe to or read online their newsletter. The smart players will be needing the information to make sure they don't miss out on the best specials around. Check out their blog to keep current with all the goings on at Bingo Hall. Good Luck playing! This site doesn't really look impressive but it kind of look like a cartoon and I actually like the star mascot. The main reason I wanted to give it a try was the $25 bonus that all new players get just for signing up, and that is a really nice bonus. I didn't win much from this bonus, but I was able to make a nice start. After that, there's a 300% bonus up to $750, which is quite a good start. The bonus goes on, and for the first three deposits, you can get a maximum of $1,100 which is great! The list of promotions doesn't end there, and you should definitely check the list on the site to make sure you get the most of it. I will just mention chat specials and Team Bingo offer. There are 8 rooms in total, so you can get all the bingo action you want. Bingo hall is definitely one of my favorite sites to play at! They have got so much to offer here, I literally did not know where to begin. They have a nice $25 welcome bonus that they start all new players off with. This definitely lasted me a while and I had a blast trying out some of their games without using any of my own cash just yet! They also continue the bonuses with three hefty deals on your first three deposits. In total, they are topping off your gaming experience with a total of 1,100% worth of deposit bonuses. They have a nice selection of bingo here, including the standard varieties that we all know and love. They have tons of patterns to choose from, along with a number of rooms to play in and some pretty incredible jackpots to try out for! This site is definitely worth your time! The Best Bingo News From BingoHall!